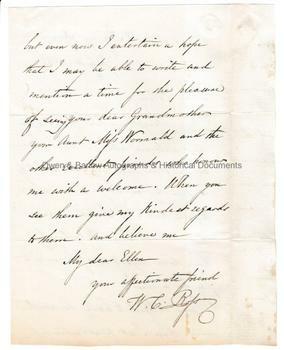 WILLIAM CHARLES ROSS Autograph Letter Signed. Sir William Charles Ross, RA. English painter, known for his portraits and, particularly, his miniatures. ALS. 2pp. 38 Fitzroy Square. July 16th 1856. To "Dear Ellen". 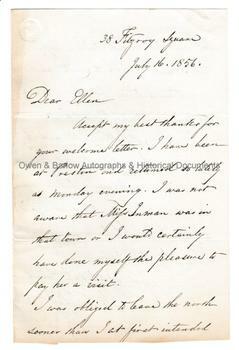 "Accept my best thanks for your welcome letter. I have been at Preston and returned so lately as Monday evening. I was not aware that Miss Inman was in that town or I would certainly have done myself the pleasure to pay her a visit. I was obliged to leave the north sooner than I at first intended but even now I entertain hope that I may be able to write and mention a time for the pleasure of seeing your dear Grandmother, your Aunt, Mrs Wormald and the other excellent friends who honour me with a welcome. When you see them give my kindest regards to them, and believe me, my dear Ellen, your affectionate friend W.C. Ross." 8vo. 17.5 x 11.5 cms (7 x 4.5 inches). The bifolium blank leaf excised to a stub and previously used for the purpose of mounting. Fine.